How Can I Go Adventures In Florida? Where is Adventures In Florida in Geneva on the Map? Greg Pflug (owner of Adventures In Florida) has a lot of experience leading outings and it shows in the way he organizes and plans his trips. You might not always know exactly what you will be doing, but you can always be sure you will have a good time! Greg also knows a lot about the flora and fauna of Florida and is always willing to share that information, as well as lots of entertaining stories, with anyone interested. The food is awesome, the scenery beautiful, the trips fun, the leadership experienced and knowledgeable. Whether kayaking, canoeing, wildlife viewing, swimming, or playing, you are bound to have an incredible time on a trip with AIF. So... if you are in the Orlando area and feel like getting out on the water, Adventures in Florida is a great choice! You won't be disappointed! by far the best thing to do in orlando. if you can afford it set up a private tour. Greg Pflug is a trip. Wow. What an experience. Four days camping on the Roanoke River was everything I needed. The weather was amazing. October in NC was beautiful! Leaves changing, platform camping six feet above the swamp. Only a drizzle the last night, I should be rating this two stars because of the rain but the Sunnyside oyster bar in williamston nc, mimosas on the river for breakfast, and just general tomfoolery and shenanigans was so fun. Don't be worried though, safety is a priority for adventures in Florida, and by the end, I guarantee you'll learn something- either about Greg's one piece sparkling leotard or yourself. We kayaked a bunch of rivers, and saw things I never would have seen before. From manatees, to gators, to cypress trees, the trip we took showed us so much. Greg and his guides are incredibly skilled, and they'll be able to show you so much of Florida and the wild-you can't find these opportunities anywhere else. On my trip to Florida (March 2015) I did a day trip kayaking the Wekiva River with Adventures in Florida (AIF) and I cannot recommend it more. Every step of the process was fantastic! After booking a trip on one river, Greg (from AIF) emailed me with a note that the river I had booked had a pretty low water level, and offered me the option of switching to a different location which is spring fed (and has higher water.) Having picked the location randomly, I definitely appreciated the guidance and went with his recommendation. Our tour guide was Dave, and he was great. He was knowledgeable about the different kinds of birds and was friendly and fun for everyone there. (Our group had 9 people ranging from a child of around 4 years old who kayaked on her Mom's lap, a few teenagers and a few adults. He interacted really well with the whole group.) Note that with a group of 4 or more people, the website advertises that you can schedule a private trip if you prefer. The kayaking was supposed to be done at around 2 PM, but we were having a great time and Dave had us go down all sorts of side channels, so we were out there until past 3. The Wekiva flows in to the St. John's River which is more public (so no alligators) and we stopped to swing from a rope swing into the water. The entire trip was incredibly beautiful. We saw all kinds of birds along with a few alligators which was really cool. We didn't see any manatees in the water or bears on the sides, although those are found in the area. Things to bring with you: - Camera in a waterproof (sealed) bag - You definitely will want to take pictures, and you don't want to ruin your camera/phone. A waterproof bag with a cord that you can wear around your neck is perfect. - Sandals - I forgot these and ended up going barefooted. In the boats this was fine, but when we stopped for lunch, sandals would have been nice. 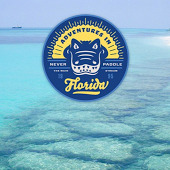 I definitely hope to take future trips with Adventures in Florida and recommend it to anyone!